William Hosie was born in Cos Cob, Connecticut, attended Skidmore College and has a BFA and an MFA in Sculpture from the University of Pennsylvania. His work has been exhibited at The DeCordova Museum and Sculpture Park; The University Museum of Contemporary Art, and Herter Gallery, University of Massachusetts, Amherst; Taber Gallery, Holyoke Community College; Dabora Gallery, Brooklyn, NY; Downstreet Art, North Adams, and Storefront Artists Space, Pittsfield, MA. Hosie works with small scale, interrelated bodies of sculpture called ‘sitings’ using humble materials such as plaster, wood, cardboard, styrofoam, plastic, paper. They are built, half-built, un-built, re-built, recalling a vast playground of toy-like structures, and often contain embedded color-coded shapes which add energy, direction, and movement to these forms. As a high school student he travelled throughout Mexico during the summer of 1970, and has been a frequent visitor for the past two decades. Pre-Hispanic architecture has inspired much of his work. Christin Couture was born in Springfield, MA, and has a BFA in Painting from the University of MA, studied at the Brooklyn Museum Art School, and has had Fellowships at The MacDowell Colony; Yaddo; the Millay Colony; and Fondation Karolyi, France. Her work has been exhibited at El Rojo de Tacubaya, and Galeria Arvil, Mexico City; Monique Knowlton Gallery, New York City; Dabora Gallery, Brooklyn, NY; Boston University Art Gallery, MA; the DeCordova Museum & Sculpture Park, Lincoln, MA; The University Museum of Contemporary Art, UMass, Amherst. Couture’s figurative paintings possess an edge of mystery and foreboding. Her subjects range from children and infants that are inspired by Victorian photography, to other natural phenomena such as icebergs, volcanoes, and her own backyard. She has lived and exhibited in Mexico City over a period of 40 years, and owns a small rooftop studio in the historic downtown with a splendid view of the volcanoes. She was a friend of the late author Raul Ortiz, who translated Under the Volcano into Spanish. Couture and Hosie have had collaborative exhibitions at the Museo León Trotsky, Mexico City; Historic Northampton; the Brattleboro Museum & Art Center; Northampton Center for the Arts; and Wm Blizard Art Gallery, Springfield College. 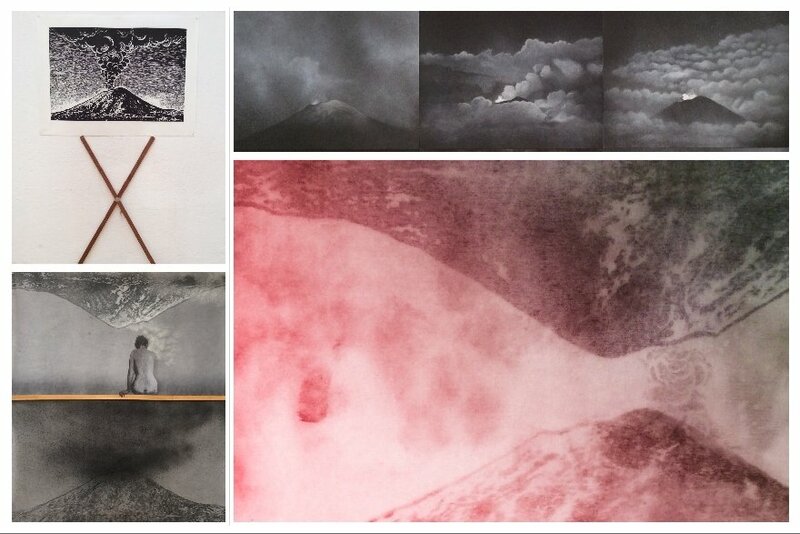 An essay about their collaborative exhibition, Bajo el Volcan, by Veronica Volkow, was published in La Journada, Mexico City. An essay by Miriam Moscona accompanied Couture’s solo exhibition, Volcanix, and was later published in La Revista de la Universidad Autonoma de Mexico. They live and work in Shelburne Falls, Massachusetts and the East Village, New York City.